Once I got my pollen analysis from my first honey harvest, I was a bit disappointed that it was almost all from crepe myrtles instead of a wide spectrum of native Austin plants. However, after reading this article in the New York Times, it could have been a lot worse. Turns out urban beekeepers in Brooklyn were finding red “honey” in their hives, and it was eventually discovered the bees were raiding a local factory that makes maraschino cherries. I think this is a good lesson on hive placement because bees are going to take the least path of resistance when gathering nectar. If they find an abundant food source close to the hive, they will take advantage of it. Unfortunately for these beekeepers, this food source was chock full of Red Dye No. 40. Obviously, a beekeeper can’t take into account everything within 3-5 miles of their hive, but knowing the area well will help you figure out these odd occurrences. 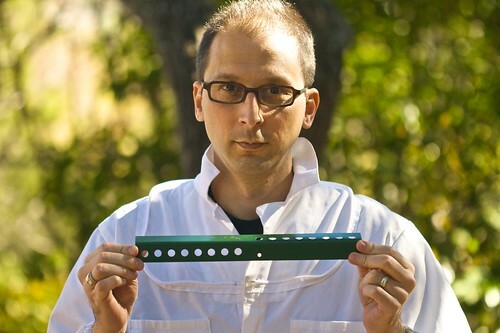 Here in Austin, we had a similar event except this time it was green honey instead of red. Our guesses were either cotton candy or snow cones/popsicles, but we never found out anything definitive. Austin had its first hard freeze last night and the temps dropped to about 27 degrees. This appears to be an isolated incident as the 10 day forecast has the lows back into the mid-40’s, but it is a good reminder that winter is just around the corner for those of us in southern climates. By mid-afternoon it was sunny and back in the 60’s so I went to check on the girls. The top hive feeder was completely empty so I added another 2 quarts of sugar solution to make sure they have enough food for the winter. I didn’t go into the hive at all since it was so cold last night, and I want to disturb them as little as possible during these colder months. It may be back in the 70’s by next weekend so I’ll probably do one last inspection before closing up shop until next spring. I also took this opportunity to install a mouse guard to prevent unexpected house guests in the hive over the winter. Here is a picture of me modeling the latest in mouse guard fashions. After initially putting it on backwards, I finally got it right. It basically fits over the hive entrance and has 3/8″ holes that allow bees free access to the hive but keep out the meeces. It also acts as an entrance reducer so the bees were a bit confused at first, but quickly figured it out. 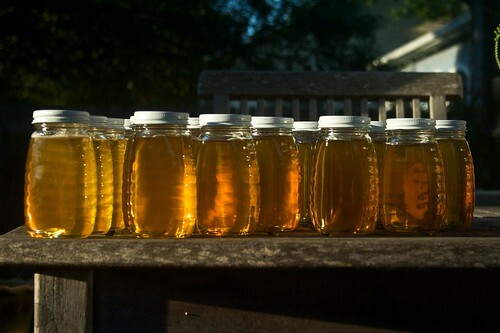 Thanks to everyone who has taken time to read about my beekeeping adventure. Hopefully it has inspired some folks to take up beekeeping or been a good resource for new beeks like myself. I also have to thank Large Marge and the girls for making my first year so successful. I just ordered another package of bees for the 2nd hive I’ll be starting in the spring, but I then wondered if I should also order a new queen for Large Marge’s hive. Most books I have read suggest replacing the existing queen each year, but I wanted to get some opinions from more experienced beekeepers. Anyone have any strong opinions/suggestions on requeening each year? 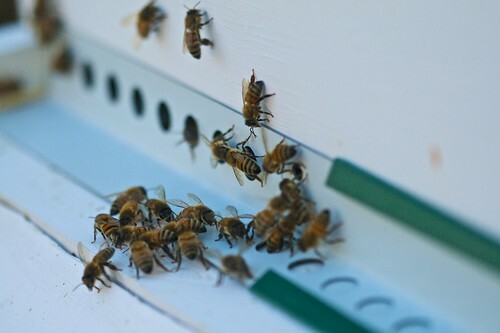 For anyone (especially those in Texas) who are thinking about starting your first hive, now is the time to place your order for a spring delivery. Beekeeping has become very popular in the past few years so if you wait too long to order, the apiary may no longer be able to fulfill your request. If that happens, you are either stuck waiting for an additional year, or getting lucky enough to catch an early spring/summer swarm. Your local beekeeper association should be able to give you a list of reputable aparies that supply bees with good traits. The only two I know of in Texas are R Weaver and B Weaver aparies. I personally used B Weaver, and I’ve had great success my first year into beekeeping. I liked that fact that B Weaver had a local pickup option for your package (instead of them arriving in the mail) plus they stopped using chemicals to treat varroa mites in 2001 meaning their bees should be better adapted to cope with these pests. So if you are thinking about taking the plunge into the exciting world of beekeeping, don’t delay and get your bees ordered!